A battle between conference leaders turned into a moment Los Angeles Football Club laid down the gauntlet. LAFC traveled to the nation’s capital and thumped D.C. United 4-0 behind a hat trick from Diego Rossi and a red card for D.C. star Wayne Rooney early in the second half. The result makes it five wins in six for LAFC, with a draw at Yankee Stadium against New York City FC three weeks ago the lone blemish. It’s early, but the Black and Gold are setting the pace atop the league with 16 points. The D.C. United captain immediately knew he was in the wrong and accepted his sending off about as peaceably as you’ll ever see a player do so. Rossi capped off his hat trick in the 76th minute by taking a touch and finishing a feed from Christian Ramirez. 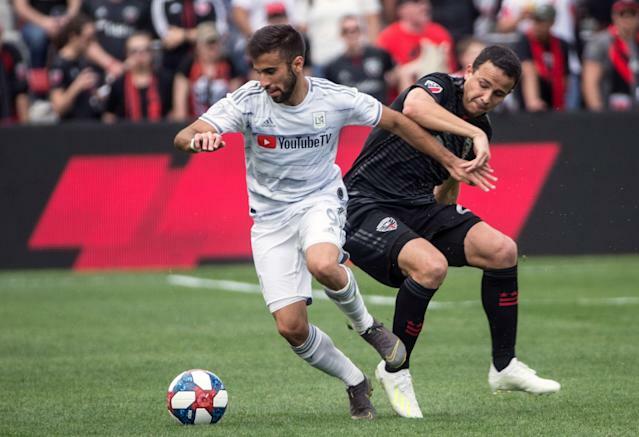 D.C. United had been unbeaten in four matches, and the club has been terrific since Rooney joined up midway through last season, so they’ll likely be fine going forward. Saturday’s result was more about LAFC, which has already won three games by three or more goals and looks every bit a contender to win MLS Cup, if not the outright favorite. Yes, it’s early. Tell that to anyone trying to stop them at the moment.